Instrotech is offering Kobold’s MMA range of industrial temperature probes, or insertion resistance thermometers, with or without transmitter. The MMA is engineered using 316 stainless steel and incorporates high accuracy Pt100 resistance sensors with analog output options. The MMA is delivered standard with M12 or DIN plug electrical connections, as well as a wide variety of popular process connections. • Economically priced digital thermometer with optional plug-on display. • Compact construction with or without transmitter 4-20 mA output and PC-configurable range by software. • Measuring range of -198 to 250°C (more on request). • Pt100 sensor class A, 1/3 DIN, 1/10 DIN or cryogenic. • Process connection threaded clamp DIN 32676, VARIVENT or union nut DIN 11851. • Electrical connection DIN 43650, or M12. 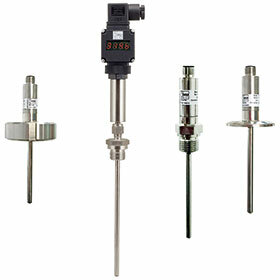 This quality range of economically priced temperature instruments is suitable for a wide range of industrial applications such as heating installations; furnace and apparatus construction; machine construction and building installations; marine engineering; food and pharmaceutical industries; and other general industrial applications.